The Philippine culture is rich in customs and traditions. Philippines culture reflects the complexity of the history of the Philippines through the combination of cultures of foreign influences. Spanish colonization of the Philippines lasted for more than three centuries. There is a significant amount of Spanish-Mexican influence within Filipino culture, customs and traditions. Hispanic influences are visible in traditional Philippine folk music, folk dance, language, food, art, and religion. Pre-Hispanic and non-Christian Philippine cultures are derived from the Indigenous tradition of the Austronesian primitive tribes called Malayo-Polynesian. The Philippines was a colony of the United States from 1898, at the end of the Spanish-American War, until 1946. American influences are evident in Philippine culture by the use of the English language, and in contemporary pop culture, such as fast-food, music, film, and sports. Other Asian ethnic groups such as the Chinese, and Japanese have been settling in the Philippines since the colonial period, and their influences are evident in the popularity of mahjong, jueteng, Filipino martial arts, and other Asian cuisine. Family relationships are the basic building block of Philippine culture and society. Each Filipino is at the center of a large circle of relatives, usually extending to third cousins. Marriage is rarely permitted for members of the same kinship circle. The kinship circle is customarily enlarged through ritual co-parenthood, the Catholic custom of selecting godparents to sponsor one’s child at baptism. In the close-knit Filipino family, members are provided assistance when needed and expected to give their first loyalty to their kin. In rural areas the villages contain clusters of households supporting an extended family system within the Philippines culture. The social support provided by these close-knit communities is reflected in the absence of retirement homes. 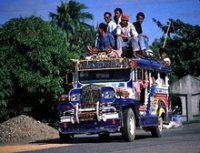 Foreigners and tourists who have experienced the Philippine culture and being with Filipinos find them very hospitable. This is a common trait that Filipinos are known for to most foreigners who have traveled around the country. The attitude of Filipino people towards foreigners and other people is said to be exceptional. Even the humblest home along the road can serve as a shelter for a stranger who has lost his way. In Filipino culture, serving other people the best of what they have gives them an honor and a promise of true friendship. A typical Filipino house is not completely called a home without any facility ready for guests. It is filled with new and nice-looking items reserved only for them while ordinary ones are for everyday use. Arriving at your host’s house during mealtime may be awkward but if it’s in a Filipino house, you will be asked to sit down and share what they have on the table. Because eating alone without asking others according to Filipino culture is considered rude. These manners picture how Filipinos accept and properly respect the presence of their visitors. A form of hospitality that comes truly from the heart, just like how the country made its image as the land of true smiling people considering the struggling economy, political confusion and rising poverty in the country. You may be surprised to see how such situations are handled in Philippines culture. It is like taking everything from them except their love of joking. Joking and laughing at everything perhaps give them relief and makes them see things more positively. Traveling in this country means more of building a rapport with its people and understanding the Philippine culture, customs and traditions. Filipinos love entertaining foreign visitors; whether to help, or for whatever reason, interacting with them is unavoidable. Consequently, aside from the country’s stunning natural assets, meeting the Filipinos promises you true friendship and memories to keep.